Looking to get some good pizza in northwest Columbus — and at a place where you can drink an adult beverage, watch an NCAA game, and shoot some pool or throw some darts? If so, I suggest Bier Stube/Bier Stube Pizza, located at 2390 West Dublin-Granville Road on the stretch of 161 between Rt. 315 and Sawmill Road. In the interests of full disclosure, I need to note that my nephew, Joe Hartnett, runs the pizza joint. Family connection or not, Joe makes a damn good pie. The crust is crisp and not too thick, and the sauce is tangy and sweet. What I really like, however, are the meat toppings. The sausage is especially good, served in large, spicy chunks that seem to snap between your teeth. Equally important, as the photo of the sausage and pepperoni pizza above suggests, at Bier Stube Pizza they don’t scrimp on the toppings. 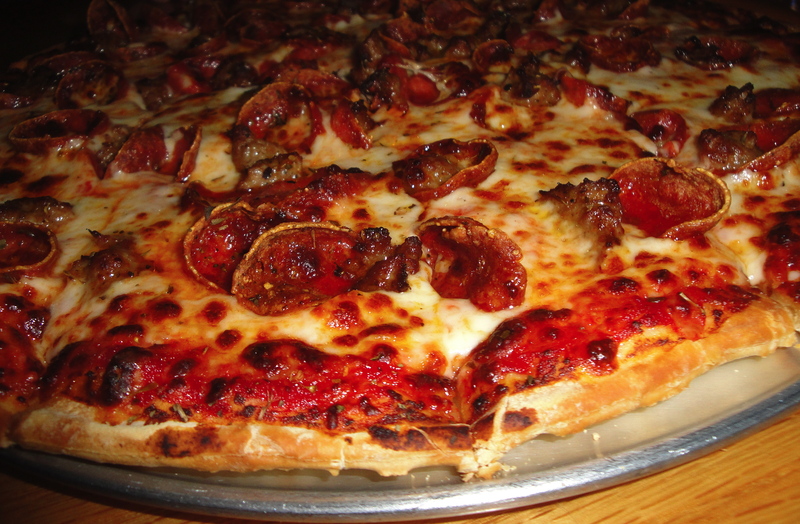 The signature pizza is the “Big Al,” named for Joe’s Dad; it is a man-sized meal that is loaded with toppings. 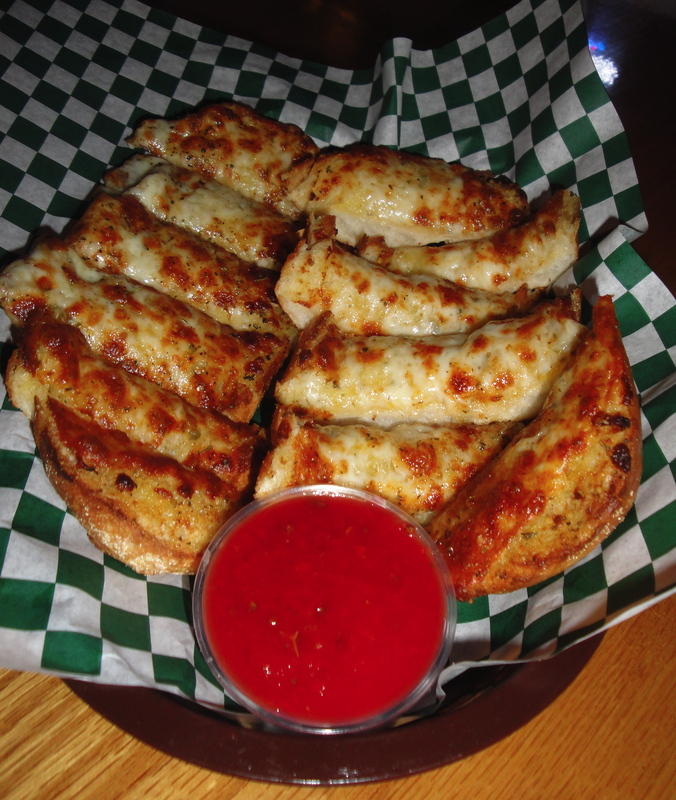 And while you are waiting for your fresh-baked pizza to emerge piping hot from the oven you can sample some pretty good bar food, too — like cheesy bread and fried mushrooms. They all go down well with a cold one. Bier Stube Pizza is a neighborhood place with neighborhood prices. You’ll get your money’s worth, and if you give it a shot you’ll be supporting a budding local businessman and entrepreneur who takes a lot of pride in his product. Why not try it the next time you have a taste for a well-made pizza? It’s spring break at the Academy, and Kish wanted to get away from Columbus for a few days. But where to go for a short, relaxed, not-too-pricey holiday? 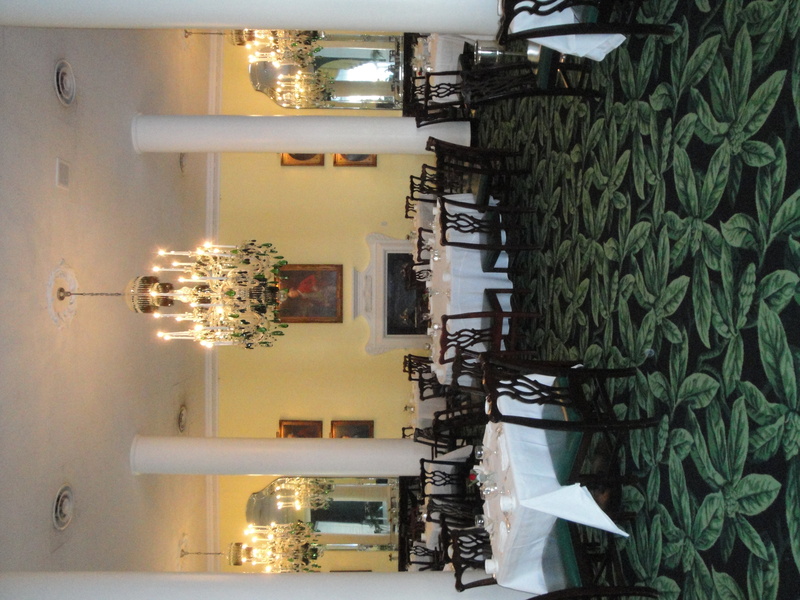 We’ve always wanted to visit The Greenbrier — that ancient, rich-with-tradition hotel-resort in White Sulphur Springs, West Virginia — but it always seemed too expensive to be a realistic option. With it being off-season, and with the economy still struggling and people traveling less, I thought perhaps we could get a deal this time. Sure enough, a visit to The Greenbrier website showed that was the case. To comply with the terms of the deal, we arrived yesterday and are leaving Wednesday. I didn’t know quite what to expect of The Greenbrier, but it is an extraordinary place. First, it is huge. When you arrive, you see this enormous, all-white, multi-winged building looming in the distance. I was stunned by the sheer massiveness of the place. Second, the hotel just reeks of older days, when people spent times in common rooms and waiters and bellmen and doormen were everywhere to be seen. 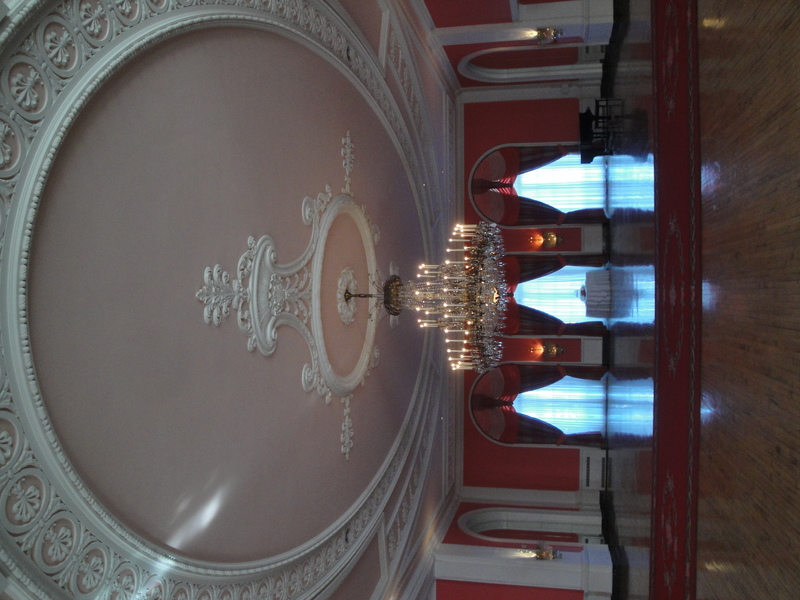 The Greenbrier has an enormous number of public rooms, and all of them are colorfully, strikingly decorated. The effect is jaw-dropping. Yesterday we drove over from Columbus and wandered around, and last night we had a splendid meal in the main dining room. Today we will be taking the “bunker tour,” where you can see the facilities that were constructed to house the legislative branch of government in the event a nuclear attack wiped out Washington, D.C. I’m very much looking forward to that tour. You so often read and hear about bad conduct by student athletes, it is refreshing to read about acts that reflect class and sportsmanship — and when the student athletes in question play for the team you root for, it is even better. Yesterday, after Ohio State had beaten Penn State in the Big Ten Tournament championship game, and after both teams had learned that they were in the NCAA Tournament, Buckeyes Jon Diebler and Jared Sullinger went to the Penn State locker room to congratulate Talor Battle and the other Nittany Lions. It was a nice gesture, and it was appreciated by the Penn State players. Ohio State and Penn State played each other three times and have gotten to know each other as a result. Any time a team makes the NCAA Tournament, they deserve congratulations, and it was nice to see Diebler and Sullinger deliver their best wishes to the Nittany Lions in person. As for me, I think there is a lot to like in this scrappy Penn State team, and I’ll be rooting for them to do well — at least until they play the Buckeyes again.